Attending Développement Économique West-Island – CLD e-marketing conference today. Very interesting topics on current #emarketing and #ecommerce trends and consumer behaviours. Each year, too many people are diagnosed with cancer. Battling this disease means dealing with harsh side effects, such as hair-loss and other debilitating consequences that greatly affect them and their families. Since 2005, the CanDonate Hair Program has been helping to restore confidence and self-image of children residing in Quebec, who suffer from cancer, by donating free natural hair wigs. Unfortunately the costs for these hair prosthetics are too often impossible for children and their parents with cancer to cover on their own. The CanDonate Hair Program provides a much needed resource for young cancer patients struggling with a very difficult challenge. For over 10 years, the Foundation has given hundreds of free wigs to children with cancer through its various partnerships. Now in its 10th year, the CanDonate Hair Program wants to expand its efforts to help also women and men suffering from cancer across the province of Québec. To realize this goal, the Foundation is organizing an event called “A Part of Me”. The “A Part of Me Gala” will feature 10 women and children who have been selected to get a full makeover (natural hair wigs made from recent hair donations, clothing, spa treatments as well as other beneficial products provided by our various sponsors). We will be following them to portray the physical and psychosocial effects that cancer has on their person. We will be showcasing their journey at the Gala, by video presentation. The CanDonate Hair Foundation will aim to raise awareness and funds to strengthen the support we offer to children and aim to helping adults, residing in Québec, who have lost their hair due to chemotherapy. By coming to our Gala, you will contribute to helping this worthy cause. Take a look here at the incredible work we have done so far. PLEASE, BE A PART OF THIS INCREDIBLE JOURNEY! The CanDonate Program that donates natural hair wigs and a makeover to cancer patients is inviting people March 15 to donate their hair. Camille Ross speaks to one of the makeover recipients and a very special little girl who wanted to donate her hair and is the star of their viral campaign. 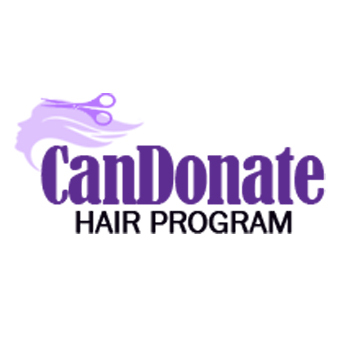 This is what it’s all about… The CanDonate Hair Program – Be A PART of IT!